Looking for a unique spin on basic mashed potatoes? This cheesy bacon version is what you need! There are a few things in life that I just love. My husband. My kids. The Office on repeat. Shopping with my mom. Harry Potter. Caramelized onions. Bacon. You know, the basic things in life. The last two – caramelized onions and bacon are what I’m going to focus on today. 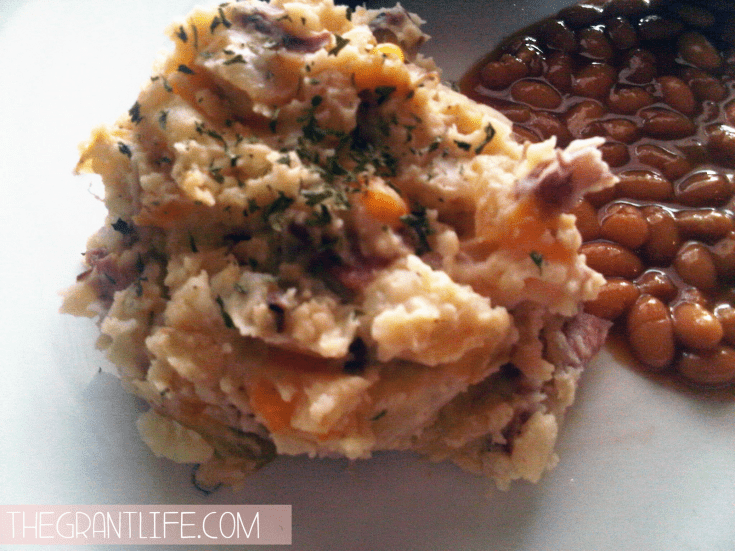 I took my love for all things cheesy and bacon-y and combined them with mashed potatoes. Cheesy bacon mashed potatoes were born and my heart exploded. 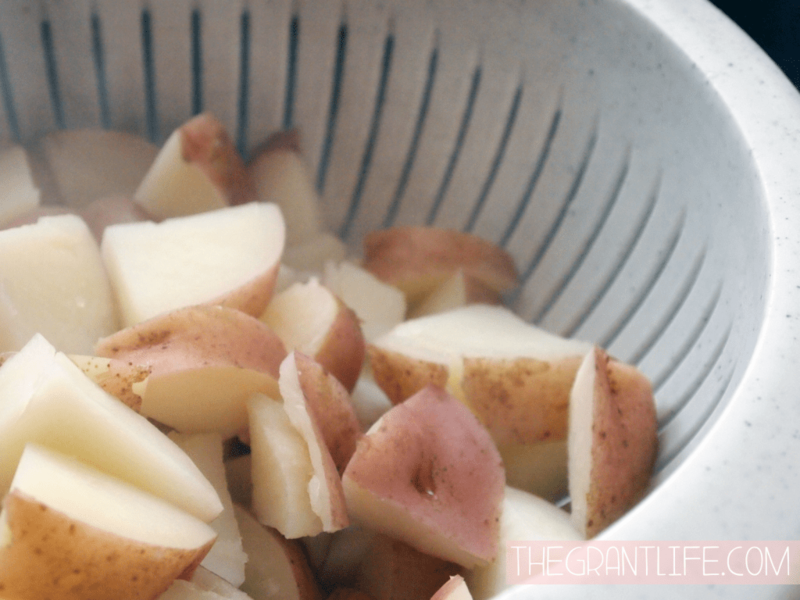 The name sort of implies what’s in this easy side dish recipe, but there are a few extras that take these potatoes over the top. They take mashed potatoes from meh to amazing. From ho-hum to holy-yum! You can pick any potatoes that you would like for this recipe. 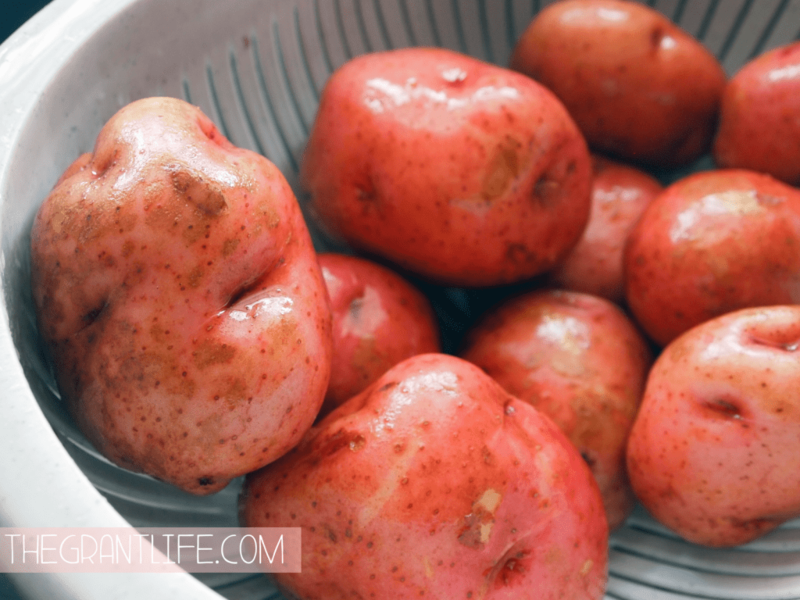 I tend to use red or golden potatoes just because they seem to end up creamier than Russets. You can also pick if you want to peel your taters or not. For the sake of time, I normally don’t take off the skin. 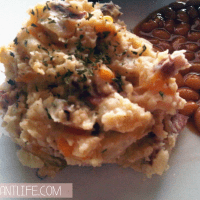 Cheddar cheese is best in this cheesy bacon mashed potato recipe but feel free to use any cheese you prefer. Mozzarella would probably be a yummy choice too. Again, use any onion variety you would like for this recipe. I like sweet onions but white or purple onions would be just as delicious. Sour cream, butter and milk give these potatoes a super creamy texture. I normally use all three in all my mashed potato recipes because they are so good together. And we can’t forget bacon! It’s the star of the show here. You need about a pound of bacon so pick something that you like. Save the grease for bacon fat popcorn! How do you make cheddar mashed potatoes? To make these cheesy bacon mashed potatoes you start by washing, chopping and boiling your potatoes. You can also start frying up your bacon at this point as well. Once the bacon is done add in your onion, using some of the bacon grease to fry them. Your onions need to continue cook for a few minutes in the bacon grease. Once they start to become translucent, soft and really fragrant, they are ready. 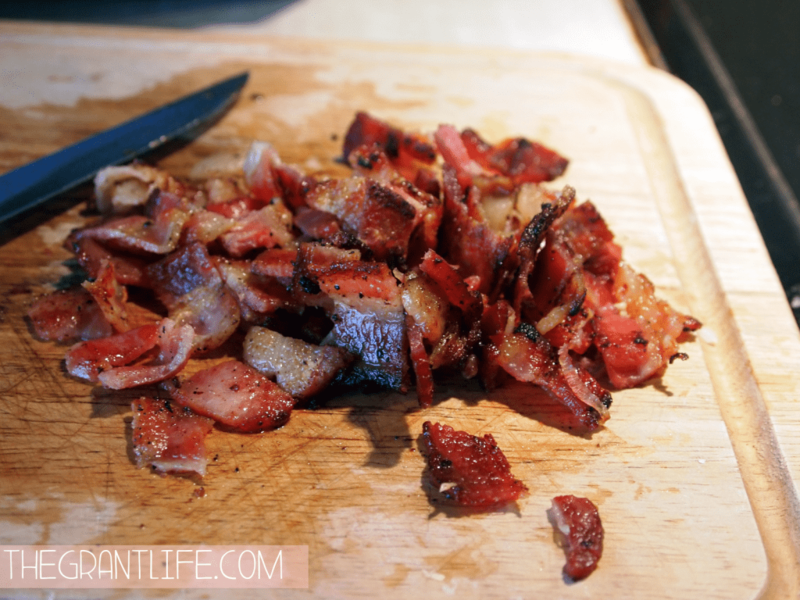 Chop your bacon and add it along with the onion to your rinsed and cooked potatoes. Add in the milk, sour cream and butter at this point as well. Mash using a potato masher, an immersion blender or a hand held mixer until creamy. Mix in your cheese and spices once you have mashed your potatoes. 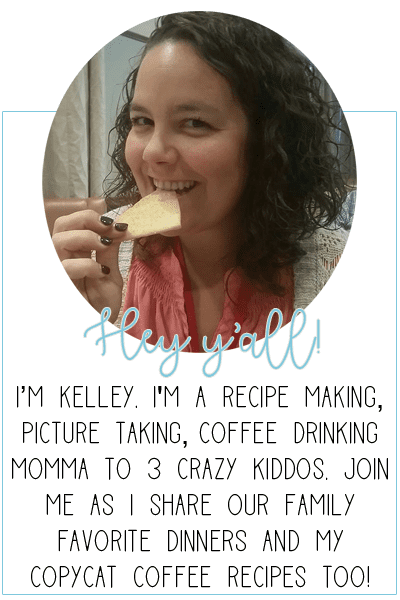 Serve up with your favorite quick and easy dinner recipe! Now that you have the mashed potato recipe down, you are going to need some delicious main dishes to pair them with. We had ribs with ours one night but the following also make great entrees. 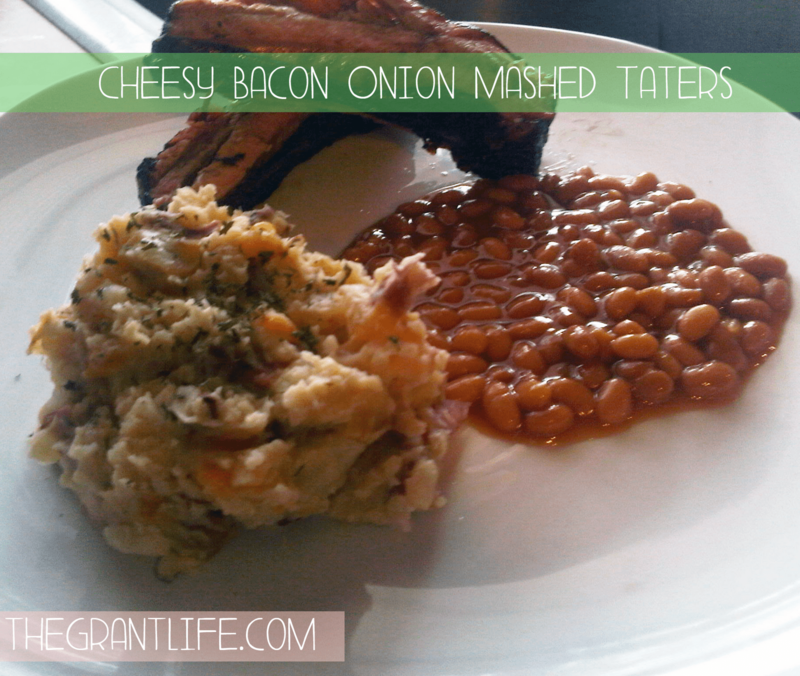 Cheesy bacon mashed potatoes with caramelized onions! Place the potatoes in a pot of water on the stove top over medium high heat. Bring to a boil. In a skillet, fry up the bacon until crispy. Remove and save the grease. Add the onions to the bacon grease and fry until soft, translucent and fragrant. 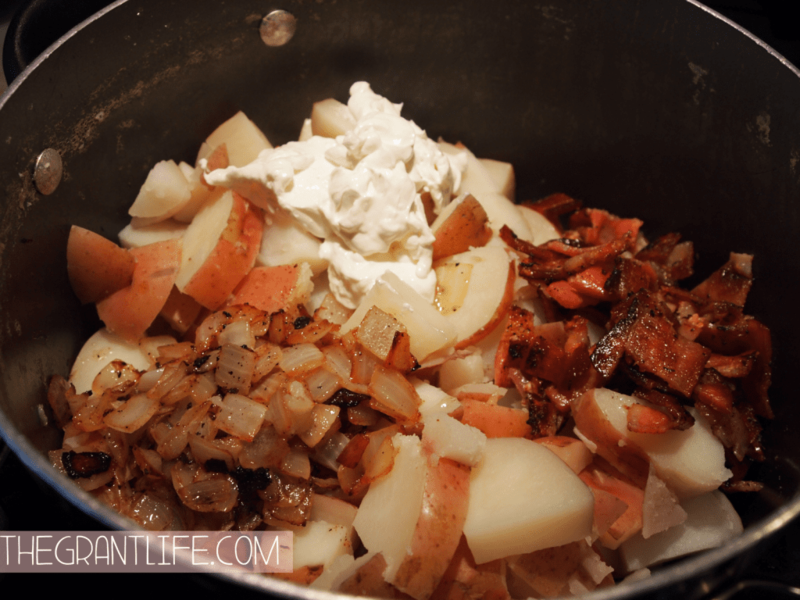 Add the bacon, onions, sour cream, milk and butter to the drained and cooked potatoes. Fold in the cheese and top with fresh herbs. Yum yum yum that sounds and looks so delicious!